We ask for prayer regularly for those who worship with us and for those whom they love. We have a Congregational Care and Communion Team which visits with those who cannot worship with us as often as they would like. Each week those who have email, receive a weekly email from our pastor with words of encouragement and information about upcoming worship. If a member of our church family is ill, he or she receives a card through our Card Ministry. We offer fellowship once a month, when babies are baptized, and other special occasions in the life of our church. We like to roll up our sleeves to help around the church as we are able, including decorating the church for Christmas and Easter, putting-up the life size crèche both outside the church and inside, and supporting each other when life gets difficult. We offer unique ways to build community during worship. For instance, our paper bag Christmas pageant required no rehearsal but offered a meaningful and fun approach to being actively involved in telling the Christmas Story. Others helped tell the story of the Wedding Banquet. Opportunities to contribute based on one’s skills are central to the life of our church. 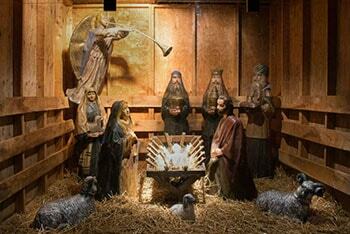 If you have a gift and or skill, you’ll find a place to use it at Trinity Church. Trinity is committed to community beyond our walls in Manchester, in Carroll County, and internationally. We are involved in a variety of outreach efforts in the name of Christ. 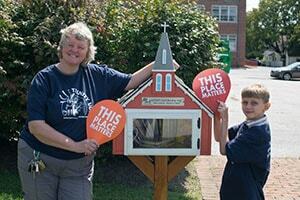 Manchester’s first Free Little Library which is dedicated to children’s books is located on our church property. The Little Free Library is a shared effort between the church, Manchester Elementary School, and the town of Manchester. This Library belongs to everyone! You, your neighbors, friends, and people who pass by. Anyone may use it! This Little Free Library offers a way to share good things to read in our community. Little Free Library is honored by The Library of Congress for creating communities of literacy. A Little Free Library is a “take a book, return a book” free book exchange. In its most basic form, it’s a wooden box of books where anyone may pick up a book or two, or bring a book to share. Little Free Library book exchanges have a unique, personal touch and there is an understanding that real people are sharing their favorite books with their community. These aren’t just any old books, this is a carefully curated collection. The Library itself is a piece of neighborhood art that acts like a mini-town square. A Little Free Library promotes community and a sense of caring for those living in the community. TAKE BOOKS – If you see something your child would like to read, take it. You can even take two! SHARE BOOKS – When you are finished reading, return the books to the Little Free Library or pass them on to a friend. If you can’t bear to part with them, keep them and bring back different children’s books to share with others. GIVE BOOKS – Do your part and keep the Little Free Library well stocked with high-quality children’s books – share your favorites. Pay it forward! To donate larger quantities of good condition children’s books, simply drop them off at the designated boxes inside Manchester Elementary School and inside Manchester Town Hall. Why Is Trinity UCC Interested in Being Part of This Effort? Our church is committed to community within and beyond our walls. We are expanding the directive “Feed my sheep” to “Read to My Sheep.” We believe that by providing books to those who might not otherwise have access to them, we are demonstrating our commitment to community and helping to shine God’s light of care in Manchester. We cook for the residents of and staff the cold weather shelter in Westminster, MD. We began this effort in two years ago by working at the shelter one night and have expanded to working two nights during the winter months. Carroll County opens an overnight shelter from mid-November to April 1. 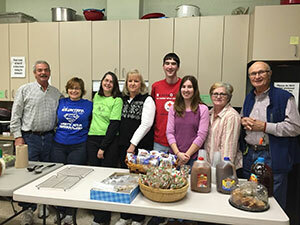 It is staffed by volunteers from the community. 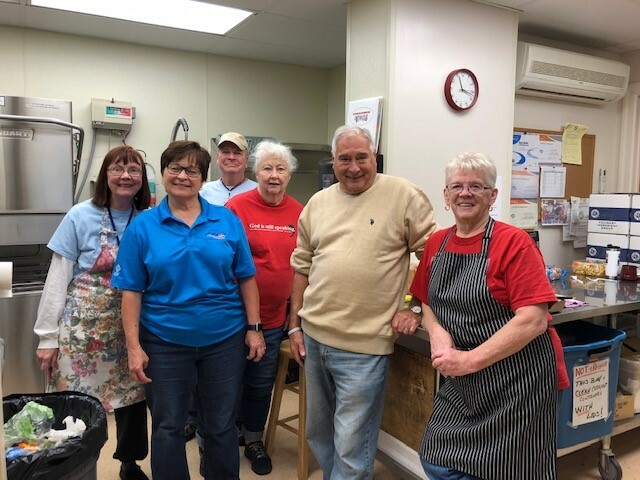 Our congregation helps staff and provides a warm meal for the 30-40 homeless people who depend on this facility during the cold weather months. We have seen people with various chronic illnesses and people lacking warm clothing. So we also donate clothing and over the counter medicines to the shelter as well. serve meals at the Meal and More lunch program. Which is held at St. Paul’s UCC. Westminster. Sue Myers, Robert Miller and people from St. Paul’s UCC. The caring committee responds to emergency requests from the community. We partner with Human Services Programs and NESAP to guide individuals to resources available. Along with HSP and NESAP, we provide assistance with rent, utility, gasoline, auto repairs, food, and insurance. Coordinate our Giving Tree which provides families with Christmas gifts and Thanksgiving and Christmas meals. Each year as part of our Bible School program, Trinity supports a mission projects in the wider community. In 2015, we undertook two missions, collecting school supplies to fill 21 back to school backpacks for Manchester Elementary students and offering support to the people of Nepal following devastating earthquakes. Monetary donations were divided between the UCC Disaster Ministries and Mission 14. 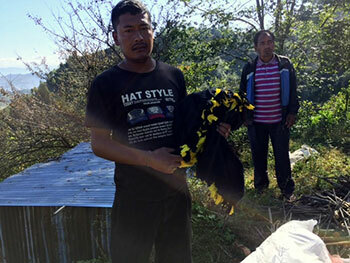 We also made fleece blankets to be distributed in Nepal. One year, we collected shoes for a village in Honduras after one of our members participate in a mission trip to that village. 2014 – Collected over 500 supplies for Women’s and Children Shelter in Westminster. 2013 – Collected food and funds to help feed, trap, spay and neuter feral cats in Manchester. 2012 – Collected shoes for kids in Honduras. We are into our fifth year of donating, packing and delivering 25 food bags monthly to Manchester Elementary School. 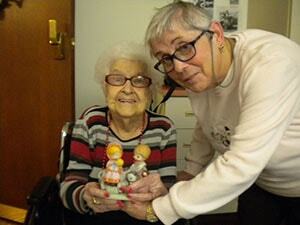 The congregation donates more than what is needed each month! The school children are very appreciative of what they received and several students have sent us handmade thank you cards. Monthly we also bless and donate prayer shawls made by our members and friends to Dove House as well as friends and family members of our church who could use a prayer and a tender touch. Due directly to our Trinity UCC Food Bags Program Project, another group started the same partnership with EBB Valley Elementary School. We are indeed spreading the word of feeding God’s children. Trinity participates in Manchester’s Black Friday event each year. Immediately after the lighting of the town tree, residents cross the street to Trinity for the lighting of our outdoor crèche and for hot chocolate, cookies, and the treat of hearing our Director of Music Ministry play the keyboard and sing carols. For many years, our church has sponsored two community blood drives a year.